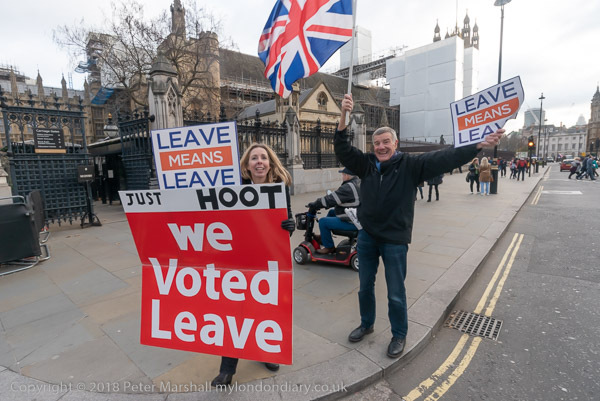 I hadn’t gone to London to photograph the continuing protests over Brexit, but found it impossible not to go and take some pictures when I found myself walking more or less past them on my way to the station. Perhaps I should have chosen another route, but I’ve got in to the habit when I have time on my way home to go down Whitehall, often on a bus, to see if anything is happening opposite Downing St, then alight at Parliament Square to see if there are any protests either in the square, in front of Parliament or a little further down the street at Old Palace Yard. I suppose on this occasion I was pretty certain that there would be protests over Brexit. 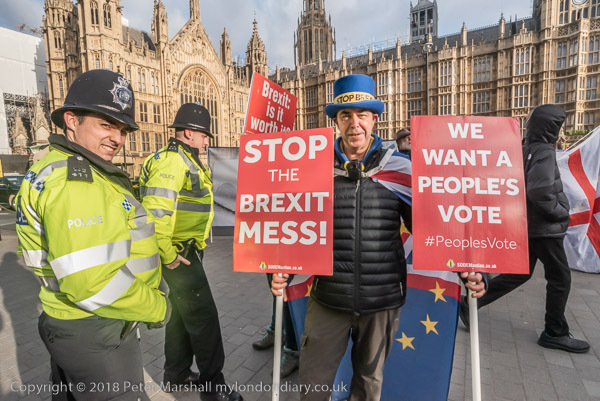 Steven Bray and his SODEM supporters have been there at least a part of every day Parliament is in session since some time in 2017, and much more recently there have also been ‘Leave Means Leave’ people with posters on the pavement outside the House of Commons and by the traffic lights in Parliament Square most days as the debate hots up. Of course there isn’t a great deal of interest in taking the same people doing the same things every day, and there have been days when I’ve just gone along, had a brief look and perhaps exchanged a few words with some of the protesters and then gone along to walk or catch a bus to the station. 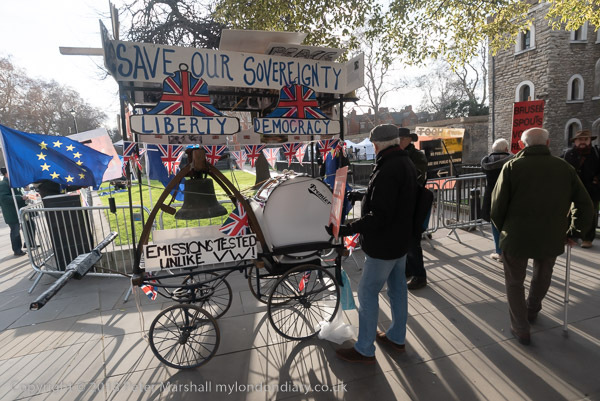 But January 9th was a busy day, probably because of some debate taking place in Parliament, and pro-Brexiteers had come out in larger numbers than usual, some bringing with them a waggon with a large bell and drum which were being used with monotonous regularity. 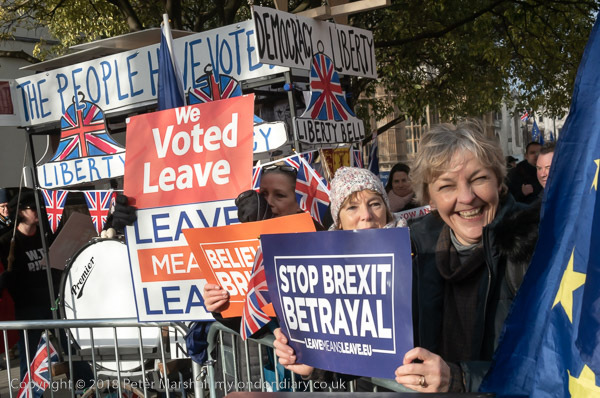 While the ‘Leave Means Leave’ supporters were making their views clear in a reasonable manner and having sensible conversations with some of the remainers and members of the public, other pro-Brexiteers were intent on rather different behaviour. Most of this group were wearing yellow jackets, and one man in particular stood out. 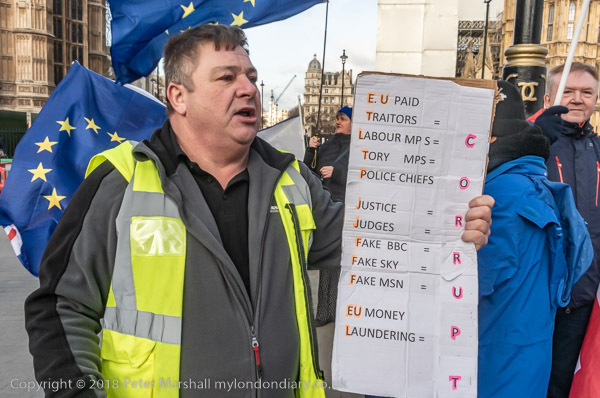 He held up a large poster with on one side the text ‘Guy Fawkes Movement 2019 Yellow Jackets’ and the threat ‘Out means Out Or Civil War – No More Lies’ and on the other a list labelling Labour and Tory MPs, police chiefs, judges, the BBC, SKY and MSN and more as corrupt, while coming to shout at and harass Steven Bray and other SODEM protesters. When Bray complained to police he came and shouted abuse at both him – calling him a ‘cry-baby’ and the police who were largely standing around and failing to keep the two sides apart. 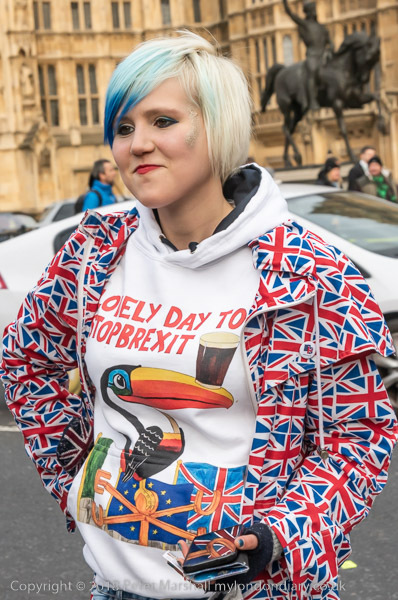 The SODEM supporters, who included ‘Alba White Wolf’, Madeleina Kay, voted ‘E U upergirl, wearing a union flag jacket and a t-shirt which says ‘LOVELY DAY TO STOP BREXIT’ – and apparently to drink Guiness – did their best to ignore the harassment and continued their protest. I didn’t stay long – that bell and drum were rather annoying, as was the ignorant shouting, and left to catch a bus to the station. I walked past again a couple of days later, when things were much quieter as there were few protesters apart from SODEM present, and I only took a handful of pictures before moving on. This entry was posted on Friday, April 5th, 2019 at 08:53 am and is filed under My Own Work, Political Issues. You can follow any responses to this entry through the RSS 2.0 feed. You can leave a response, or trackback from your own site.